Just as air, food and water are necessary for life, clean laundry is necessary for a nursing home’s existence. 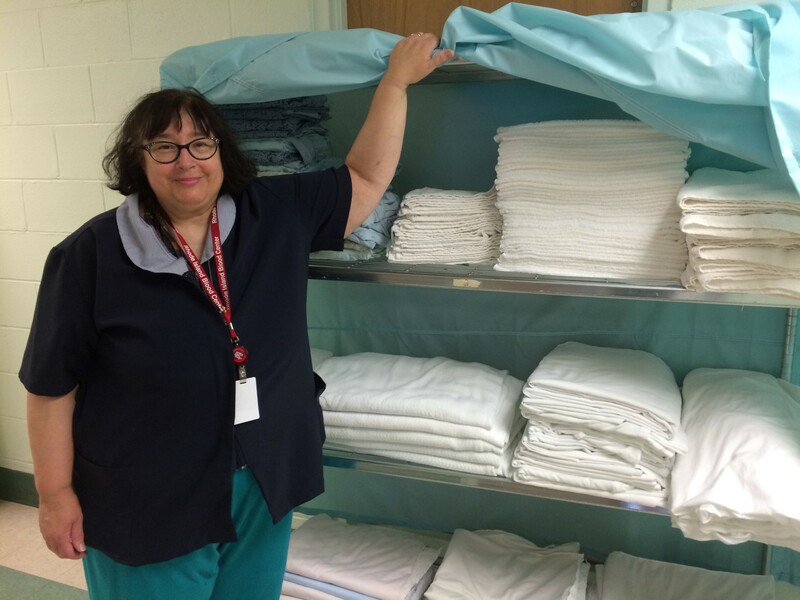 Maria Periquito, Cheryl Miller and Barbara Branca are Linn Health & Rehabilitation’s three laundry room workers. They keep every washable article clean and tidy. Each day two of the three are scheduled to begin work at 7 AM, attacking a mountain of laundry all day until they punch out at 3PM. In a typical day, they wash 10 loads of laundry in the 60 pound washer and another 10 loads in the 50 pound washer. Three huge industrial dryers are always running simultaneously in the laundry room, which registers about 80 degrees warm by the afternoon. The bins of dry laundry that need folding are as seemingly endless as Rumpelstiltskin’s mountain of straw and the service that they provide is gold to Linn Health & Rehabilitation. Not only do these three women do the laundry for 84 residents, but also clean all the linens, jonnies, towels and bed curtains at Linn Health & Rehabilitation. In addition to that, they wash, dry and fold all the table cloths for Winslow Gardens’ dining room every day. They also wash all the rags and mops for the housekeeping department, following strict health department guidelines in the process. These laundry ladies have to have good organizational skills and attention to detail. Maria explains the system to me: they fill up four large carts and two smaller ones by the end of each day to deliver back to one of the nursing home floors. One day they wash clothes for the short term rehab residents on the third floor and the next day they wash clothes for the long term nursing care residents on the second floor. All the residents’ clothing have their names on the inside clothing tags and they sort the clothes to each resident’s assigned space on the cart. I took a photo of a cart so you could see it, along with the smiling face of our positive and perky laundry room worker, Barbara. I marvel at their incredible physical strength required to do their jobs. It takes a lot of stamina to be constantly on their feet and a lot of upper body strength to continuously move their arms in order to fold the clothes. They are dedicated to United Methodist Elder Care: Barbara has worked here for 7 years, Maria for 14 years, and Cheryl for a whopping 17 years! Thanks to these three beautiful women, the residents are tidy, clean and huggable! In celebration of laundry workers week, let’s be sure to thank and hug a laundry worker too for all the important work that they do!